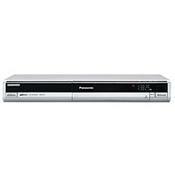 The Panasonic DMR-EZ17 DVD Recorder combines functionality and versatility, with abilities to record your favorite home movies onto DVD-R/W, DVD+R/W and DVD+RAM discs with an extended (4 hr) LP high-resolution recording mode. Your current DVD library will look and sound better than ever before, because the DMR-EZ17 is a Progressive scan player with built-in Dolby Digital and DTS audio decoders. I agree with Mr. Jones. This is a good little workhorse. I use it to record/edit tv shows that I'd like to keep around. I have 2, the older at around 10 years still works. The newer at around 5 years just stopped reading discs. It is too bad that products like this are just not available anymore. I used this unit without any problems for twenty months. It will not read the disc now. I have cleaned the lens but this is not the problem. I do not know if it is worth getting fixed. I used this unit alot to record television programs. I would rather purchase a good old VCR with a tuner to use. Too bad good old VCRS with tuners do not exist anymore. When hooked to cable TV and not an antenna, it might have less problems, but I can't prove it. Crashes, Freezes, Clock Stops, Does not always record at the scheduled time due to the crashes and freezes. Many, if not all Panasonic DMR-EZ17 are defective. I bought two of them and both were bad. It is very buggy. Do not buy one if you want to use it to record over the air DTV programs or any scheduled recordings. If you already have one, make sure you document the problems you have with it, so when you send it to the Panasonic repair center for the forth time, maybe you can get them to give you a refund! The clock stops for no reason, It destroys recordings that were already recorded and good, the next time it records on the same disk. It will record a program from 8:00 to 9:00 on one channel OK, then at 9:00 PM when it pauses in record mode to change channels, it freezes in record pause forever and destroys the first recording it made. The clock stops at 11:57 or 5:57 or the clock just stops. The DMR-EZ17 may run for a month or two before exhibiting these failures. I am collecting problem reports posted by others. One guy bought a 4 year warranty extension and went through five DMR-EZ17s they were all bad. I sent mine to repair twice and it came back the same way is was when I sent it in. I waited too long to send it in for repair the second time and the warranty expired while it was in repair the last time and now the unit is totally dead and they want $130.00 to repair it! It will not last more that a few short months after the one year warranty expires. I plan to call a lawyer to see if there is a way to file a class action suit against Panasonic for all these bad DMR-EZx7 units. I have all of my video equipment hooked to a UPS and Surge Protectors and my Philips DVDR and JVC VCR do not have these problems. Free shipping to and from repair. They can't fix the bugs. Some bugs may be caused by over the air DTV signals. I now have two Philips DVD HDD recorders and I love them. They are model DVDR3575 and DVDR3576. They can record on a Hard Drive or DVD. You can play a DVD or a program that is recorded on the HDD even while it is recording on the HDD.